LACOSTE COLOUR BLOCK SLIM FIT PIQUE' COTTON POLO. COLOUR BLOCK CONSTRUCTION IN CARBON BLUE & NAVY. 94% COTTON 6% ELASTANE CONSTRUCTION. 27" FROM BOTTOM OF NECK, TO HEM. 19" FROM ARMPIT TO ARMPIT. Length(neck to hem). Well-used condition with minimal signs of wear. (1 micro hole, showed on the last photo). Chest(armpit to armpit). United States -. Sleeve(shoulder to cuff). Inside washing label indicating size is missing. Puk-Puk print on front. (Iconic Fila BJ Bjorn Borg warm up tank top. prob late 70s or early 1980s. I actually think this was my mums, my dad was tennis obsessed so probably got it for her and she likely wore it once ; ). TIP - wash in cold with similar colors. Overall Length Down Back - 22.5. 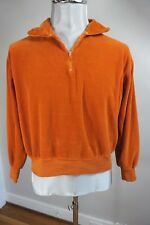 AD1981 VINTAGE ISSEY MIYAKE MEN OVERSIZED COTTON SWEAT SHIRT M MEN'S TOP RARE! (ISSEY MIYAKE INTERNATIONAL). This item was made about 40 years ago designed byISSEY MIYAKE has won the order of Culture. Length(from top of shoulder to hem):about 74 cm(approx. Shoulder: (put flat)about 65 cm (approx. ). Length: 30". Sleeve length: 34". See all photos for details. Hats may need to be cleaned or reshaped. 19”- pit to wrist. 32” - top of back collar to waist. Hats may need to be cleaned or reshaped. Long tail, permanent press 65% polyester 35% cotton, size 15 1/2 34, embroidered with multicolor pinwheel shape flowers. Smiley pockets. See photos for exact condition. 50% polyester 50% nylon embossed fabric thin with sheen. Sleeve length 22". Single chest pocket. The print looks almost like a swirling, organic, abstract woodcut, in a red cabbage/dark burgundy on white. 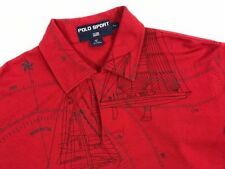 Missing the label with fabric content and place of manufacture, I am guessing by feel that the shirt is 100% cotton, and was made in Italy. Features: Pearl Snap - 2 Front Pockets - Triple Snap at wrist - Embroidered Southwest Cactus Design. 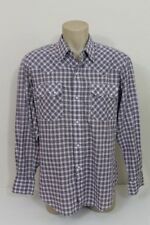 Style: Long Sleeve Pearl Snap Western Shirt. Color: Maroon. Shoulders: 19 " Across top of item. Chest: 22 " Armpit to Armpit. COLOR: and incredible plaid in yellow, black. blue, neon green. STYLINGS: loop collar, 2 chest pockets, flat bottom hem. length in back (bottom of collar to hem): 26". armpit to armpit: 24". 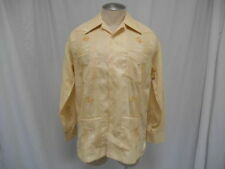 Very Nice JCPenney Big Mac Longsleeve Button Up Shirt. Great Condition. Good shape but with a few dark spots that I have photographed. TIP - wash in cold with similar colors. Overall Length Down Back - 22. Cool diamond woven pattern with double chest pockets. Great shape - Marked 4XL Size 20 - Clean & ready to go! Chest - 29. Arm Length From Shoulder Seam - 22. Collar to Shoulder Seam - 9.5. Hats may need to be cleaned or reshaped. 24” - top of back collar to waist. Loop Collar, Flap chest pockets. Made in USA, 100% wool. Collar seam to bottom of shirt (in back)-29". Shirt is in great condition, a few very minor imperfection like miniscule snags. Vintage 1960's Wrangler Sanforized Denim Western Work Shirt USA Men's 15/33 Sm/M. Shipped with USPS Priority Mail. Lightly worn. Some minor rub wear on collar. Nice vintage condition. Pit to pit 20", length 32", sleeve 23". 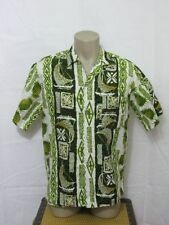 Here is a fantastic 1960s short sleeve pull on shirt. It is a yellow ban lon. It has a fantastic textured vertical diamond stripe pattern on the front. Their sizes varies from modern ones. There are a couple of minor snags. VTG WRANGLER DENIM / CHAMBRAY WESTERN SNAP SHIRT LARGE MADE IN USA . Shipped with USPS Priority Mail Padded Flat Rate Envelope. - FOR YOUR CONSIDERATION A VERY COOL VINTAGE 80S ERA CHAMBRAY WRANGLER PEARL SNAP WESTERN STYLE SHIRT. MADE IN THE USA ! PLEASE SEE ITEM DETAILS FOR MEASUREMENTS. - CONDITION = VERY GOOD VINTAGE CONDITION WITH MINIMAL WEAR AND A TON OF LIFE LEFT. COOL VINTAGE SHIRT ! FEEL FREE TO ASK QUESTIONS. Hats may need to be cleaned or reshaped. 18” - top of back collar to waist. 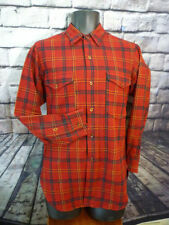 Shirt is 100% Cotton, Long sleeve, Button down. Made in the USA! Estimated Era is around 1950's or 1960's. Size on Label is 14.5. Vintage New without tags. Never worn or laundered. Still has fold creases. Made in USA. Size 16/33. Pit to pit 21", length 33", sleeve from shoulder 23". 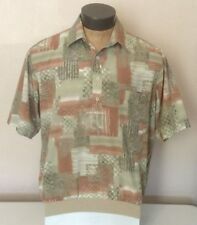 Andrade Silk Hawaiian Aloha Shirt Vintage 50s 60s Rough Condition. Shipped with USPS Priority Mail. Has small holes at armpit. Selling as is. Front top collar to bottom hem 27".